DOWNTOWN VIBE VOL. 1 – Welcome to EZ Edit Music ! 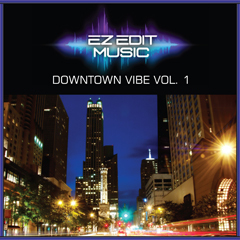 This collection is comprised of music loops that are useful for content requiring an urban or street feel or groove. "Street Strut" Stereo-mix plus stems. "Slap Me Back" Stereo-mix plus stems. "South Side" Stereo-mix plus stems. "Deal Me In" Stereo-mix plus stems. "Harry's Place" Stereo-mix plus stems. "Round The Corner" Stereo-mix plus stems. "Cocktail Hour" Stereo-mix plus stems. "Closing Time" Stereo-mix plus stems. "Ride With Me" Stereo-mix plus stems. "Move On Over" Stereo-mix plus stems.